Good news everybody! Futurama is back! Bad news everybody! This is the final season for the critically acclaimed animated comedy. Uh, again. Comedy Central recently announced that Season 7(B) would be the series’ last hurrah on their network. Of course, Futurama is all too familiar with cancellation with the last two seasons being part of the show’s second life after four years at Fox followed by four movies (which have been subsequently divided into the 16 episode fifth season). 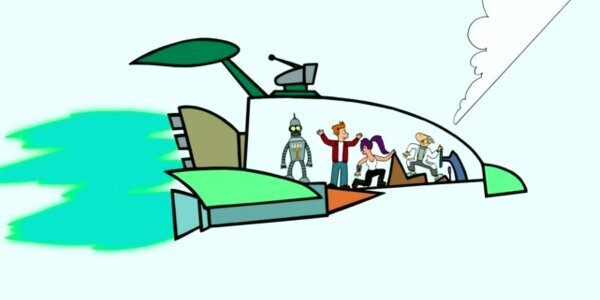 And just like the pair of episodes picked for the 7A premiere (”The Bots and The Bees” and “A Farewell to Arms”), the first two installments of 7B also featured one that focused on Fry and Leela’s on-going, yet still unofficial relationship and another that concentrated on one of the supporting members of the Planet Express crew, this time Professor Farnsworth. Of course, there were still subplots that involved the rest of the team having (or not having, as it were) adventures that, in trademark Futurama structure, eventually intersects with the main thread for the final reel. “2-D Blacktop,” the title a reference to an old racing movie called Two-Lane Blacktop, opens with a disagreement amongst the staff concerning safety regulations which takes the Professor out of his comfort zone at the delivery company and into a Fast and Furious parody. The crew is supposed to deliver a fancy, and pointy, chandelier to some off-world planet but the ship can’t handle all of the Professor’s ’Tim Taylor-ing.’ Bessie just isn’t built to fulfill his need for speed or Leela’s nafety for safety and, once she crashes back into the Planet Express building, well, she’s not built for much but the scrap heap. Good thing Sal comes to saves the days. The Professor’s not giving up on his Shippums that easy though. He’s going to find Bessie and turn her into a tepid rod. Hell, maybe a hot rod. Using parts he borrowed from the heap, he’s soon cruising the open road in his new ride. The road being open only because of how slow the speed he needs turned out to be. Fed up, a multi-cultural gang of street racers challenge the Professor to a race for medicare co-payments and, it turns out, his modifications are pretty impressive. Wrinkles got moves. The street racing sequence was okay, introducing the running gag about Minx’s verbally abusive father, but most of it was nether that funny or visually grabbing even after he Tokyo Drifts into another dimension and back. I did appreciate the bit where the pedestrian called out the policemen for endangering more lives in their pursuit of the racers endangering lives. I can see the appeal of putting the Professor into that culture to create the clash, however, most of the interaction fell rather flat. And while he was out galavanting with his new crew, the rest of the Planet Express team were battling boredom thanks to Leela purchasing the safest ship she could find to replace Bessie. It might be a clever wink to the nature of sitcoms’ reliance on a weekly adventure or event but watching the crew grow bored because their new ship’s ultra-safe features was not really funny or interesting. Still, it’s Futurama, so obviously some of the jokes landed but the episode was not nearly as good as most of the ones making up the first part of the seventh season. Did Comedy Central arrange the installments from weak to strong? Isn’t the usual practice to start and end strong? As you can tell, I was worried but then “2-D Blacktop” did pick up a lot once the two streams crossed. While out piloting their new box, uh, ship, to avoid dying of boredom, the Planet Express crew comes across the Professor and his gang, the former challenging the latter to race on the dangerous Möbius strip. Mid-race, the Professor attempts another dimensional shift but this turns him n the opposite direction resulting in a tie at the finish line. Also known as a relativistic speed, head on crash, the kind that might send those inside (and Fry, the flag-girl) into the second dimension! I loved the old-school drawing and how Fry immediately comments on how they look like stupid cartoon characters. Not as technically difficult as the animation in ”Reincarnation” (the Season 6 finale) but perhaps even more daring. The interaction with the 2-D people was also really enjoyable, the sequence saving what seemed to be a lacklustre episode. And it was nice for Minx to get a call from her dad at the end. Thumbs up. The second episode of the night, “Fry and Leela’s Big Fling,” also got off to a slow start but turned out to contain a really fantastic twist and, ultimately, one of my favorite stories of the series. The narrative was just so perfectly structured, Fry and Leela struggling to separate from the rest of the crew and finally getting some alone time (after Sean, of course) only to have the crew’s adventure reveal that their privacy was being invaded in an way far worse than before. Even if they didn’t know it at the time. The episode opens with the whole crew hanging out in the locker room and Fry and Leela both over-acting the fact that they are going home separately. After everybody clears out, including the Professor (who lives there), the secretive lovers emerge to enjoy the romantic night Fry has prepared. And even though Scruffy says to pay him no mind, it’s hard for them to share any real intimacy with him around so they head out for a walk. 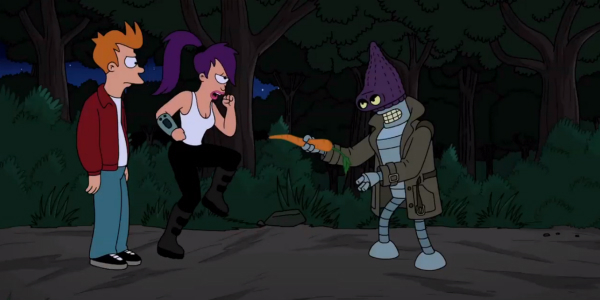 The meeting/mugging with Bender was a great moment, especially since he continues to stick them up with a carrot even after they acknowledge each other. The mischievous robot’s hard work pays off for Leela and Fry for a moment until the fancy meal at Elzar’s is interrupted by Zoidberg moonlighting as a singing busboy. Even Nibbler keeps one creep eye on them back at Leela’s place, is there nowhere in all of space they can go? Why, yes, there is! Thanks to some well targeted advertising, that Fry and Leela can’t avoid without amputation, the couple find out about an affordable and, most importantly, extra-private vacation spot. In fact, Leela has been there before with he ex-boyfriend Sean. Oh, Sean. We’ve heard about you and your musical stylings from Leela a few times in the past but will we ever get to actually meet you? Why yes, this episode! Unfortunately for Fry, the former frugal flame happens to also be vacationing at their old spot and is stuck with them because of a shuttle malfunction. No worries, the three can all share a nice skinny dip session. Oh no, there’s only enough drink tickets for two. Fry’s forced to watch his date share a beverage with her ex and it seems to be going well. There’s a sax. Finally, Fry’s had enough and challenges Sean to a fight, the commotion bringing the latter’s wife out of the woodwork. Things then get heated between Darlene and Leela and it looks like those two might Denny’s fight until word comes that the shuttle is fixed. No way is Sean going to be charged for another day, so they split finally, finally leaving Fry and Leela alone. Right? All that’s left is a few apologies and be quiet, human mating! And while the couple have been through hell to have this intimate moment, the rest of the crew have been catching up with some old primate acquaintances. The ‘romantic’ storyline was alright but most of the laughs in “Fry and Leela’s Big Fling” as well as the big revelation come from the subplot involving the make-shift Planet Express delivery crew. The only reason Fry and Leela are allowed on vacation is because the week’s delivery is going to Simian 7, a planet of the apes that isn’t exactly human friendly. The Professor is forced to send Zoidberg and Amy (in marmoset pyjamas) with Bender to take a bunch of old cars to the primate world so the tires can be used as office chairs. While there, they happen upon Gunter (from ”Mars University”) who agrees to keep Amy’s secret and show them around. The tour takes the group to a bunch of nice places, including a little fine dining, before the monkey eventually shows them their much more humane zoo. The animals there don’t even know they’re in captivity! I must say, even at this point, I had no idea where we were headed until seeing the ‘Human Habitat’ sign and when I realized who was inside, I burst out laughing. Not just a clever twist but also very funny to see them through the looking glass. Amy, Zoidberg, Bender and Gunter try to appeal to the Zoo’s director but seeing that it’s Dr. Banjo (from ”A Clockwork Origin”), I knew not to expect much help. And even after seeing a tape of Leela and Fry bashing them, the friends still decide to save the couple from further embarrassment. Too bad that means running into almost all the wild beasts they’ve encountered on their adventures before being swallowed and then passed by a Moon Worm. Damn! Just a second too late! How did Amy survive? Never mind. After a sluggish start, both of the back-to-back episodes eventually picked up, the second much more than the first, making me pretty hopeful for the rest of Season 7B. Futurama returns with Episode 3, “T. : The Terrestrial,” next Wednesdays at 10 p.m. ET on Comedy Central. And, if you haven’t seen it already, be sure to check out the sizzle-reel for the rest of the seventh season.